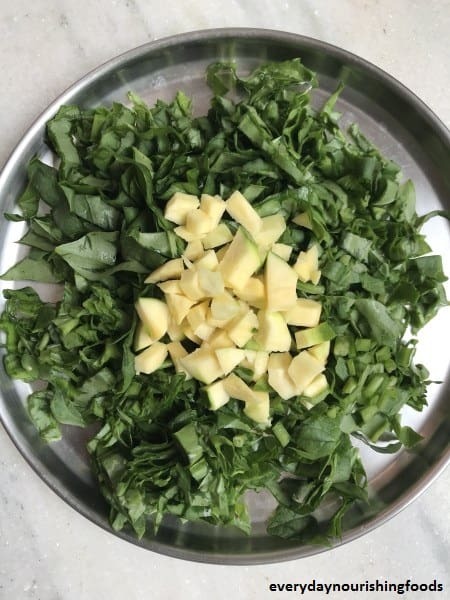 Malabar spinach chutney is my favorite recipe made in motar pestle with Malabar spinach and raw mango as main ingredients. Now we are getting raw mangoes year around. But in my childhood days, when we get good raw mangoes in summer, this was a must to do chutney. It is called as roti pachadi in Telugu as it is prepared in traditional motar pestle. This will taste yummy with hot rice and dallop of ghee 😀 This will also taste good with any roti. 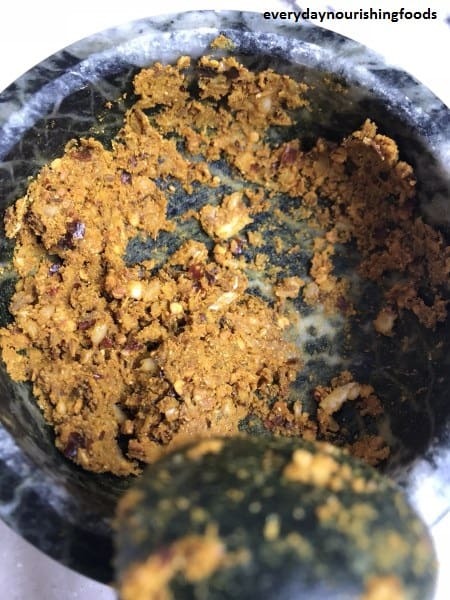 If you don’t have motar pestle, you can do this in grinder as well but make sure you don’t make it complete paste. Instead of Malabar spinach, normal spinach can also be used. You can read about tomato pachadi recipe here. Wash, dry and thinly slice the Malabar spinach. Peel and chop raw mango. Adjust the mango according to its sourness. Heat a pan and fry cumin and methi seeds without adding any oil. Add these to mortar pestle. Now add a tsp oil and fry red chili. Add fried chilli to mortar pestle. Add all other chutney ingredients except spinach, mango and oil to mortar pestle and make it into a rough paste. Now heat pan again, add remaining oil, chopped spinach and mango pieces. Let it cook on low flame for around 10 minutes until mangoes are cooked. Now add this mixture to mortar pestle and crush it. All mango pieces should be mashed completely. Empty everything into the bowl. 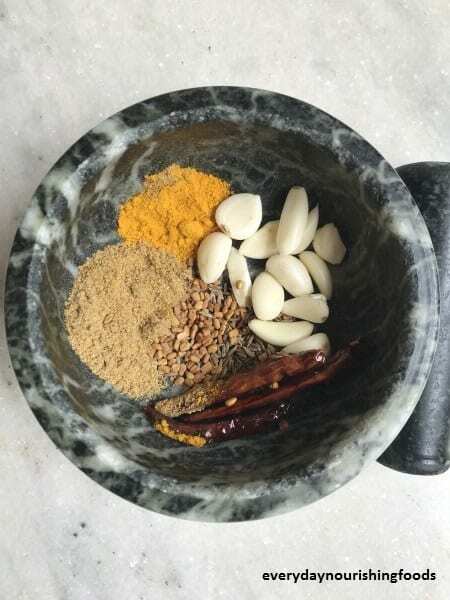 Make tadka with all ingredients and add to this. Mix everything well and is ready to serve. Heat a pan and fry cumin and methi seeds without adding any oil. Add these to motar pestle. Now add tsp oil and fry red chilli and add it to motar pestle. 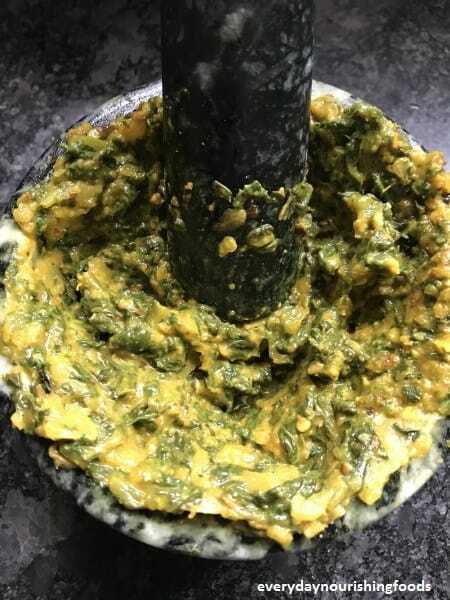 Add all other chutney ingredients except spinach ,mango and oil to motar pestle and make it into rough paste like shown below. Now heat pan again , add remaining oil, chopped spinach and mango pieces. Let it cook on low flame for around 10 minutes until mangoes are cooked. Now add this mixture to motar pestle and crush it. All mango pieces should be mashed completely. Empty everything in to the bowl. Make tadka with all ingredients and add to this. Mix everything well and is ready to serve. Eat with hot rice and dollop of ghee. Malabar spinach chutney will also be good with roti or bhakri. Malabar spinach chutney recipe can be easily doubled or halved. Mentioned quantity will serve around 4 people. 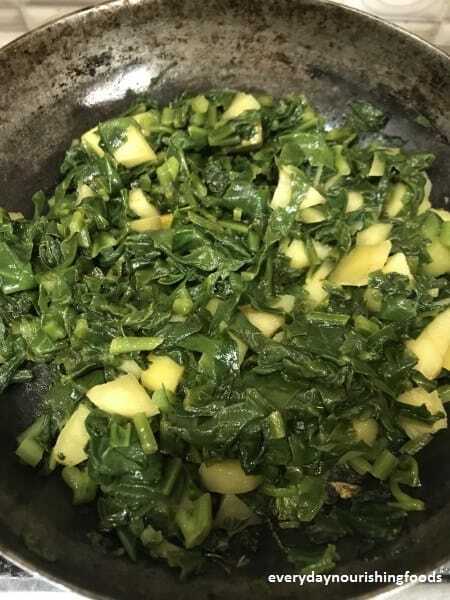 You can prepared this dish with normal spinach as well.